Two bad shootings, two guilty cops. One family sues and gets a million dollars; the other sues and collects not a penny. Joseph Erin Hamley, 21, was wandering lost and alone on an isolated stretch of Highway 412 near the Ozark National Forest, fumbling with the toy balls he kept in his pockets. Born with cerebral palsy, Hamley had shaved his head in solidarity with his brother, who was about to go to Iraq with the Arkansas National Guard. As part of a year-long investigation of fatal shootings by police, The Washington Post identified and examined the cases of 59 officers who were charged over the past decade for fatally shooting someone while on duty. In criminal court, 11 of the officers were convicted and served time. But when 46 families of those shot and killed by police sought justice in the civil system, 32 received monetary awards, The Post found. For more photos and graphics, see The Washington Post's special project here. The haircut gave Hamley an unfortunate resemblance to a young man who had just escaped from a prison boot camp. A passing motorist alerted the Arkansas State Police. Trooper Larry Norman raced to the scene at speeds over 100 mph, jumped out of his cruiser, aimed his shotgun at Hamley and ordered him to the ground. Confused, Hamley lay on his back. The trooper ordered him to roll over, and Hamley raised his arm to turn. Norman saw the motion as evidence that Hamley was armed, and he opened fire, killing Hamley. Norman had been on the scene for less than a minute, records show. Hamley’s mother sued the state, which settled the civil lawsuit for $1 million. A year later, the trooper pleaded guilty to negligent homicide, a misdemeanor in Arkansas. Norman, who apologized to the family at his sentencing, served 54 days in jail. A thousand miles away and four years after the Hamley shooting, Elvira Fernandez called Phoenix police. Her son Danny Rodriguez was high on meth and threatening her. She wanted the police to calm him down. Officer Richard Chrisman confronted Rodriguez in his mother’s trailer. The young man’s pit bull reacted aggressively, so Chrisman shot the dog. Then he held his handgun to Rodriguez’s head, pepper-sprayed him and zapped him with a stun gun, records show. When Rodriguez, 28 and unarmed, picked up his bicycle — to escape, his mother contends — Chrisman shot him twice in the chest. Chrisman pleaded guilty to manslaughter and is serving seven years in prison. Rodriguez’s parents sued, but a judge dismissed their case against the city, finding no evidence that the police department should have known that the officer had a propensity to use excessive force. Chrisman was ordered to pay Rodriguez’s parents $8.5 million, but he has virtually no assets. Though the spread of smartphone cameras has turned police-civilian confrontations into fodder for popular analysis, society remains reluctant to send police officers to prison for killing people. For the grieving families of the victims, civil lawsuits have proven far more likely to produce results. But the system dispenses uneven justice. As part of a year-long investigation of fatal shootings by police, The Washington Post examined the cases of 59 officers who were charged over the past decade for fatally shooting someone while on duty, allegedly crossing the line between enforcing the law and breaking it. In criminal court, 11 of the officers were convicted and served time. But when 46 families of those shot and killed by police sought justice in the civil system, 32 received monetary awards, The Post found. Settlements ranged from $7,500 to $8.5 million. The median settlement was $1.2 million. Seven families have not filed suit. When officers were criminally convicted, families won settlements in all but one case, The Post found. But when the officers were acquitted or had criminal charges dismissed, families were just as likely to win civil settlements. The review also found that families collected more money if they settled before the criminal cases were resolved. When families accepted settlements before criminal charges were resolved, they received a median award of $2.2 million. When the settlement came after criminal proceedings ended, the families received $500,000. Most of the settlements are between families and the officers’ employer. Going after the officer rarely pays off. Many lawyers don’t bother to sue the officer who pulled the trigger. As civil servants, they tend to have few assets. And if you don’t sue them, “you prevent the officer and the officer’s wife from making an emotional appeal to the jury,” said Michael Napier, a lawyer in Phoenix who for four decades has represented police officers, including Chrisman in the Rodriguez case. Even when families collect settlements, victory can feel hollow. Tarika Wilson, a 26-year-old Ohio woman, was unarmed and holding her 14-month-old boy when she was killed during a SWAT raid on her home in 2008. The sergeant in the case was acquitted of homicide and assault charges; the city of Lima settled with the family for $2.5 million. When police kill someone, the odds that their family will receive compensation can seem as random as the spin of a roulette wheel. Harold Phillips’s family still wonders if the wheel will ever stop spinning. 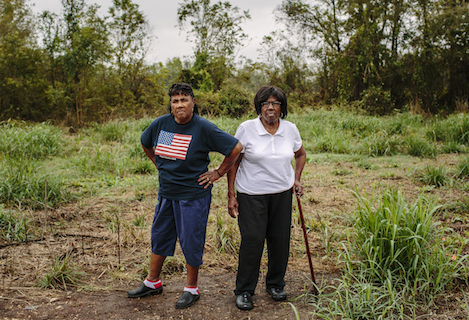 Janie Lee West, 70, and her sister Chester Mae Tucker, 72, walk down a gravel road in front of the rural property that was offered to them as compensation for the death of their brother Harold Phillips. They declined. 'It was a big mud hole with rocks in it,' West said. In July 2009, Phillips, 54, had just arrived home after a 90-day stint in prison for shoplifting. He was outside the house in Colfax, La., roughhousing joyfully with his sister, when Officer Stephen Merchant happened by and saw what looked like a domestic assault. Merchant, then 28 and on the job for less than two months, ordered Phillips to stop. Fearful of going back to jail, Phillips ran. Merchant followed, the two fought and the officer pulled out his gun. Five bullets struck the unarmed man in the back as he tried again to get away. Merchant pleaded guilty to manslaughter and was sentenced to five years at hard labor. Leaders in the little town of 1,500 agreed that the shooting was wrong. “Everyone wanted to do right by the family,” said town attorney Numa Metoyer III. The mayor and council members attended the funeral. “You bury him and bring us the bill,” they said, according to Janie Lee West, 70, one of Phillips’s seven siblings. But when West took the $10,000 funeral bill to the sheriff’s office, she was told there was no such deal. The family would have to settle the debt on its own. For six years, West made payments of $25 or $50 every few weeks from her retirement checks. Another sister, Chester Mae Tucker, paid $3,000. A few months ago, they finally paid off the Boyce Community Funeral Home. Metoyer said the town indeed offered to pay for Phillips’s burial but that the offer was valid only if the family agreed to forgo a lawsuit. The family wouldn’t make that promise, so the town rescinded the offer. Even then, the town wanted to help, Metoyer said. But Colfax is not wealthy; sometimes it can’t even pay its employees on time. So instead of cash, the town offered a couple acres of land — “a little rural piece with a little timber on it,” Metoyer said. The family turned down the land. Two years later, after repeated pleas for Hickman to respond to court orders and file the proper papers, the judge dismissed the case. By that time, the Phillips siblings had fired the attorney, who has since been suspended twice in Louisiana and Texas for violating ethics rules and failing to communicate with a client. Hickman said the Phillips case was dismissed “because the town had no money and the officer had no assets.” Court orders cite only the lack of response from Hickman and the family’s failure to hire a new lawyer. In Colfax, some people talk about the Phillips case as the kind of racially combustible confrontation that might have caused a national stir if it had happened in a larger community. Phillips was black, and the officer is white. But attorneys on both sides say race was not at play. The town’s mayor, a majority of its council members and Metoyer are all black, as is Hickman. Even when a family wins a substantial cash settlement, a different outcome in criminal court can make justice seem elusive. Jonathan Ferrell, 24, a former college football star who was soon to be married and working two jobs, had just dropped off a friend early on the morning of Sept. 14, 2013. As he drove out of the suburban Charlotte neighborhood known as Bradfield Farms, Ferrell lost control of his Toyota Camry on a curve, skidded and crashed into a stand of trees. The car was totaled. Ferrell couldn’t open the doors. He crawled out the broken rear windshield and went looking for help. Bleeding, he knocked on the door of Sarah McCartney, then 32. It was close to 2:30in the morning. McCartney opened the door, expecting to see her husband, a nurse, returning from the late shift. Instead, she saw Ferrell. She slammed the door, dialed 911 and activated the house alarm system,. The front lawn was bathed in floodlights. “There’s a guy breaking in my front door,” McCartney told the 911 dispatcher, saying she was alone with her baby boy. “Have you seen this person?” the dispatcher asked. Eleven minutes later, three officers from the Charlotte-Mecklenburg Police Department arrived. Two were African American, and one was white: Randall “Wes” Kerrick, a former animal control officer on the force for 23 months. Twelve shots ring out, the final round fired 19 seconds after Ferrell first appeared on camera. Ten struck Ferrell, most hitting him in his chest. Ferrell, the designated driver for his friends that night, was not drunk, toxicology tests later showed. He died at the scene, his hands cuffed behind his back. After then-Police Chief Rodney Monroe viewed the footage and read officers’ statements, he ordered Kerrick arrested, saying his officer “did not have a lawful right to discharge his weapon during the encounter.” A grand jury indicted Kerrick on felony manslaughter charges. It was another case of a white officer shooting an unarmed black man. The Ferrell family sued, and the city of Charlotte quickly decided to settle. The city might wind up paying far more in civil penalties if Kerrick went to trial and was convicted. Ferrell grew up in Tallahassee in an accomplished family with a strong focus on law enforcement. His sister is a sergeant for the Leon County (Fla.) Sheriff’s Office. His cousin ran for Leon County sheriff. His stepfather is a customs officer in Miami. Another cousin, Morris A. Young, is sheriff in Gadsden County, Fla.
With Kerrick’s criminal trial looming, Charlotte officials announced they would settle with the Ferrell family for $2.25 million. Part of the money went to an educational foundation in Ferrell’s name, but his mother said the money doesn’t matter. Three months later, the criminal case went to trial. Kerrick testified that he fired in self-defense after Ferrell ran toward him, disobeyed orders to get on the ground and then went for his gun. Kerrick’s attorneys portrayed Ferrell as a young man looking for trouble, said Moses E. Wilson, one of three African Americans on the jury that heard the case. Wilson, 67, a retired constable from Boston, said the panel voted five times, largely along racial lines, without reaching a verdict. The judge declared a mistrial. In August, Attorney General Roy Cooper (D), who is running for governor, announced he would not retry the case. And last month, Charlotte officials announced another settlement, this one with Kerrick. Placed on leave without pay since the shooting, the officer asked for back pay and help with his legal expenses. The city agreed to give Kerrick nearly $180,000. Kerrick also agreed to resign from the police force; he declined through his attorneys to comment. His resignation gave Georgia Ferrell some solace. “He should not work as a police officer ever again, anywhere,” she said. Families who win million-dollar judgments often say the money does little to salve their pain. But it is proof that actions have consequences, they say, that there’s a price to pay for excessive use of force. That’s the message that should have been delivered by the $8.5 million judgment that Danny Rodriguez’s parents won against Phoenix Police Officer Richard Chrisman. But the police department was protected: In Arizona, local governments are immune from responsibility for an officer’s behavior unless they had evidence the officer was a rogue cop and did nothing about it. Chrisman remains in prison; he is scheduled to get out in 2019. The family’s case against the city is under appeal. But Rodriguez’s mother, Elvira Fernandez, said she never expects to see a dime. The family could collect if they could prove that Phoenix trained Chrisman improperly or knew he had a tendency to abuse his authority. A surveillance camera once captured Chrisman planting drug paraphernalia on a mentally ill woman, and he was suspended without pay for 10 hours. But a judge concluded the planted-evidence case was too dissimilar from the shooting to serve as a warning to Chrisman’s superiors. Last month, Rodriguez’s mother moved back into the trailer where her son was killed. For five years, it remained locked, Danny’s blood still streaked across the floor and walls. After staying with relatives and living in her car, Fernandez, 65, decided she had to face the scene. “I can’t leave it like a haunted house,” she said. For weeks, she unlocked the door each day and spent as much time as she could tolerate scrubbing away the blood. “Who’s responsible?” she asked. “That officer is in prison, but what does that do? The city should pay for the damages caused by somebody who worked for them. But the city doesn’t have to pay. Alice Crites and Steven Rich contributed to this report. Derek Hawkins is attached to The Washington Post’s investigative unit through a program with the Investigative Reporting Workshop at American University.